Spectacular brand new residence in Atenas. This 3 suite residence features a living area of 3600 square feet. This beautiful estate was completed in June 07. This unique house comes with 2 kitchens, maids quarters, 2 car garage, waterfall, infinity pool and view to the airport and central valley. 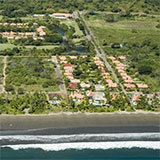 The property is situated at 6 min to central Atenas & 30 min to the airport. Over a half acre of landscaped grounds in the healthiest climate in the world!! This property is priced below market value!